A healthy, balanced diet means eating the right types of food, and also making sure you’re getting the right amounts. Eating too much or too little of any of the major food groups can be bad for your health. Here we recommend portion sizes for the key food groups that will meet an average person’s nutritional and energy requirements. Different people need different amounts, depending on how old you are, whether you’re male or female, and how active you are. If you’re trying to shed some pounds, you’ll need to be particularly careful about portion control. You may need to eat smaller or fewer portions than we suggest here. Starchy foods are our most important source of energy. It’s recommended that you include healthy, wholegrain starchy foods at every meal – they should make up just over a third of your diet. Here are some suggested amounts that you might aim for at each meal, based on an average adult looking to maintain their weight. Opt for wholegrain, less-processed versions when you can, with less added fat, salt or sugar. This will help you to make sure you get enough fibre, and feel fuller for longer. Unsure what some of these look like? It can be difficult to know how much you should be having sometimes, below are some photographs that show you what some of these suggested amounts look like. 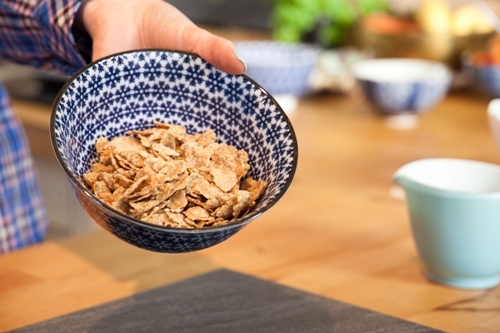 This is what 40g of bran flakes looks like in a cereal bowl. You’ll see it’s a bit smaller than what’s often advertised on the front of cereal boxes! 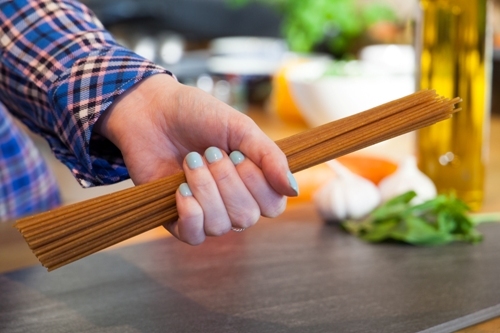 Pasta can be very tricky to gauge, especially spaghetti. 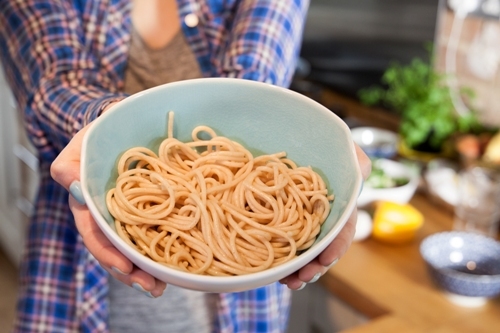 75g is the recommended serving of dry pasta – but what does that look like? Admittedly it can seem like a small amount, but appearances can be deceiving. Because when it’s cooked (see below), you can see there’s certainly enough to fill a plate for a satisfying meal. 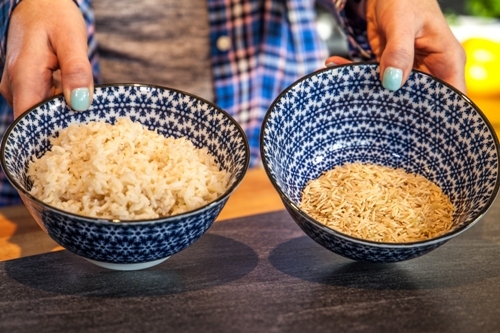 The same goes for rice – an uncooked serving of 75g can seem meagre, but as you can see it expands in size dramatically once cooked. 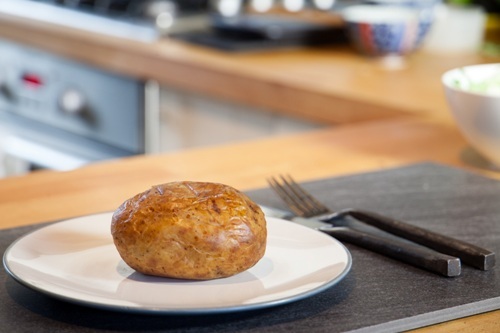 It’s tempting to pick the biggest baked potato at the supermarket, but when we say a medium-sized baked potato – this is what we mean. Not too small, not too big. You can spread the starchy food you eat over the course of a day, as shown in the examples below. You can adjust these amounts to suit your needs. If you’re trying to lose weight, the amount you have at each meal will need to be smaller. If you’re very active, you may need larger portions than this. And if you decide to include most of your day’s quota of starchy foods in one meal, just cut down throughout the rest of the day. Proteins are important for your body because they’re involved in growth and repair. As well as meat and fish, proteins can come from sources like beans and pulses. Include moderate amounts of protein in your diet – a couple of portions throughout the day should be enough to give you what you need. Here's what counts as a portion. 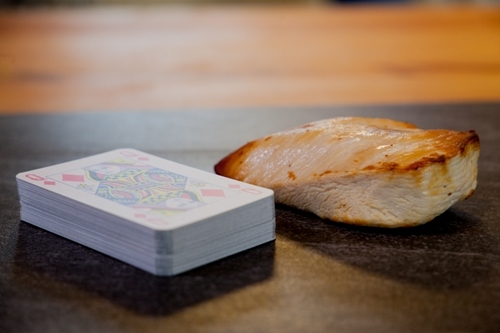 This is a roasted chicken breast about the same size as a pack of playing cards. 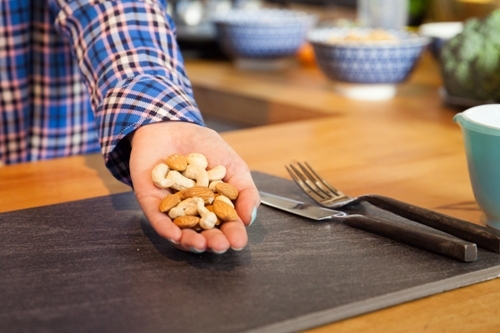 It can be difficult to judge exactly what a ‘handful’ is – here’s what a mix of almonds and unsalted cashews looks like. Here are some examples of how you might incorporate protein into your diet. Try to have two portions of fish a week, one of which should be oily fish. If you eat a lot of red and processed meat, try to limit the amount to 70g per day. If you know your portion sizes tend to be larger than this, you may find it easier to cut down by making sure you only eat red meat two or three times a week. Red meats include beef, pork, and lamb; processed meats include bacon and burgers. These can be high in saturated fat and salt, which can increase your risk of heart disease. Eating high amounts of red and processed meats can also increase your risk of bowel cancer. You also need to include some dairy foods in your diet (or dairy-free equivalents if you don’t eat dairy). These foods are an excellent source of calcium, which you need for healthy bones and teeth, as well as being another good source of protein. Have moderate amounts of dairy – two or three portions a day, based on the amounts below should be enough. Here’s what counts as a portion. When eating cheese and crackers it can be very easy to have much more than you realise. 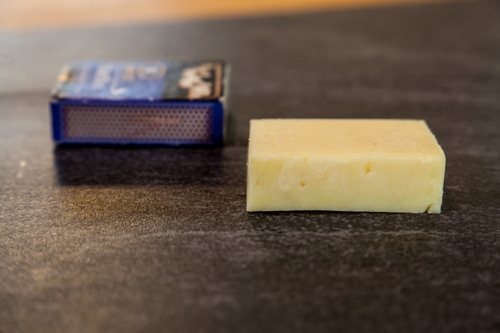 Here’s what a matchbox- sized portion of cheese looks like. Be mindful about what size glass you choose. For example if you choose a pint glass it can be tempting to fill it up. This is what 200ml of milk looks like. If you decant yoghurt from a large tub, this is about the right amount that you’re aiming for (125ml). Remember that the milk on your cereal and in your tea all counts. Go for lower-fat options when you can, such as low fat cheese or yoghurts, and skimmed or semi-skimmed milk. 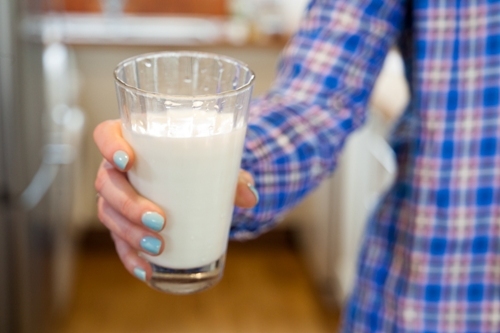 Check to see if non-dairy alternative products are fortified with calcium. Aim to eat at least five portions of fruit and vegetables a day. The amount of fruit and veg you eat should make up just over a third of your diet – most of us don't eat enough. One portion is 80g of any fresh fruit or vegetable, 30g of dried fruit or 150ml of fruit juice or smoothie. Fruit juices and smoothies only count as a maximum of one portion a day. Here are some examples of what a portion looks like. One medium fruit, such as an apple, orange, pear or banana. Two small fruits, such as kiwis, satsumas or plums. A few slices of a larger fruit, such as pineapple or mango. A large handful of grapes or berries. 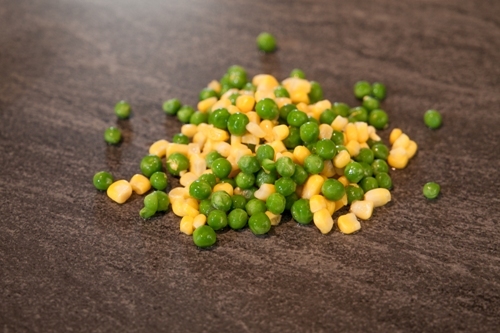 Three heaped tablespoons of peas, sweetcorn or carrots. 150ml of fruit juice or smoothie (only counts as maximum of one per day). Three heaped tablespoons of beans or lentils (only counts as a maximum of one per day). 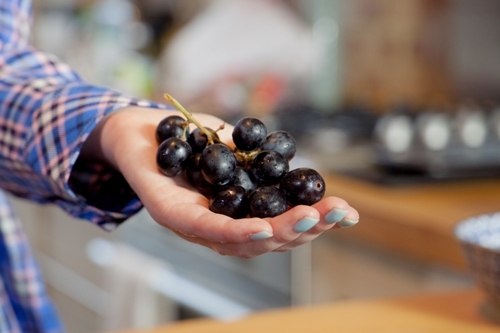 A handful of grapes makes a good snack. This is what 150ml of fruit juice looks like in a glass. 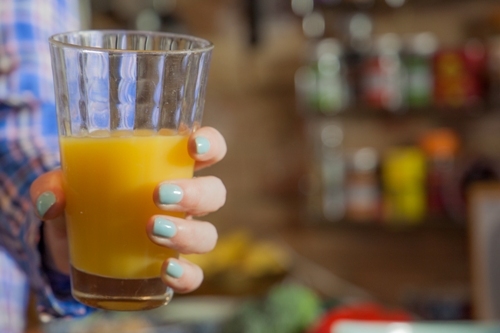 Remember, fruit juice or smoothie can only count as one of your five-a-day. 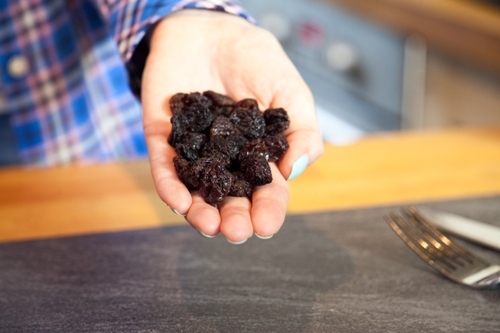 With dried fruit, it’s a good idea to use a handful as your guide rather than eating straight out of a packet. That way you know you’re eating the right amount. Mixed veg is great for adding colour to your meal. This is three heaped tablespoons of mixed veg. 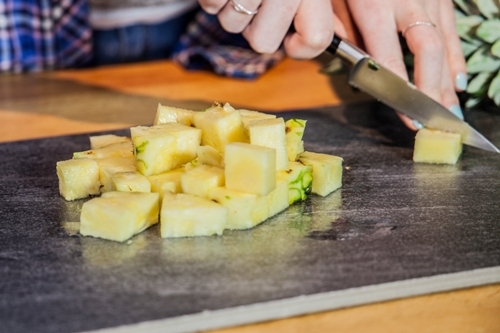 This is what two slices of pineapple looks like when diced. We need some fat in our diets, but this should mainly come from unsaturated fats. These include sunflower, rapeseed and olive oils, and spreads made from these oils. Aim to have oils, or lower-fat spreads based on these oils, in place of saturated fats when you can. You still only need limited amounts of these in your diet. If you’re looking for better portion control, try these tips a try to retrain your brain (and stomach). 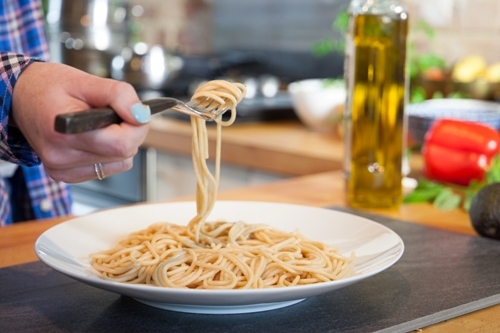 Weigh the portions that you’re used to eating every day – whether it’s cereal, pasta, meat or veg – and compare it to this guide. It may be a bit of an eye-opener and can give you an idea what you need to focus on. 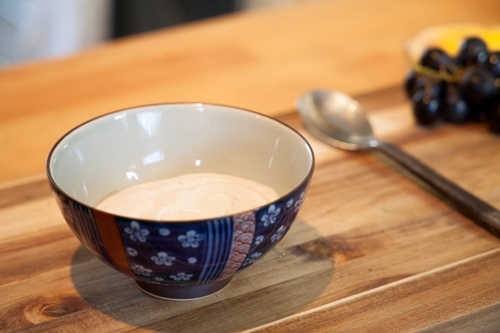 Use smaller plates or bowls for your meals. A small plate full of food is much more cheerful than a large plate that’s half empty. If your plate is looking a bit sparse, fill it up with vegetables. And if you’re craving a mid-morning snack, go for a piece of fruit. Try a spray oil to help cut down on the amount you use. You should use a lot less. Try not to eat while doing something that can distract you, such as working, reading or watching TV. This might make you eat more, as you don’t realise you’re full and may eat larger portions. Pay more attention to what you’re eating, making sure you chew each mouthful slowly and thoroughly. Have a break after your meal before you have dessert. It takes time for your brain to recognise that your stomach is full. So wait about 15 to 20 minutes before deciding if you need that extra course. Drinking alcohol stimulates your appetite and will encourage you to drink more. Alcoholic drinks are also high in calories. Cut down on alcohol if you're trying to watch your portion sizes.